Upon retiring as an educator from the Cleveland Metropolitan School District, CSC volunteer Edith Conzett joined the Peace Corps at age 66. Edith completed her service placement in Nepal, where she worked in a residential school for those with blindness or low vision. That experience led her to Cleveland Sight Center, where for over 20 years Edith has been an anchor of the Braille volunteers. CSC’s Braille department promotes Braille literacy and availability, specializing in the conversion of print materials into Braille and large print for individuals, schools, restaurants, churches, and more. As technology has improved, so has the evolution of Braille. Computer programs have helped immensely proofreading a document on a screen before the Braille prints, therefore reducing the number of errors and versions. Edith continues to learn something new as she takes on Braille work, with current projects including Advanced Placement Calculus and Physics for a high school student. She loves to transcribe literature and poetry. Through her work, she has learned French, German, Latin, Ukrainian, and Nepali. 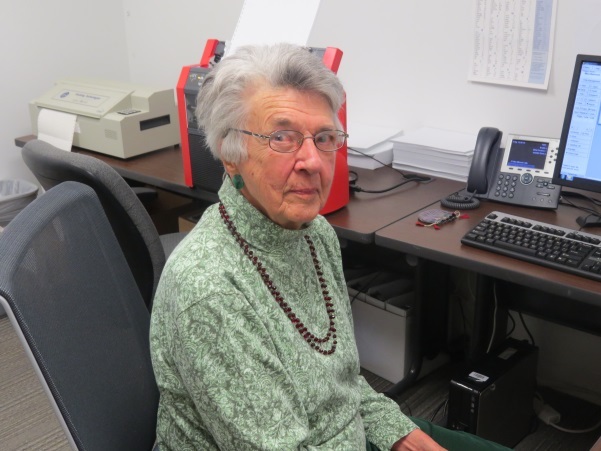 Along with CSC’s additional Braille volunteers, Edith is very humble and continues to work behind the scenes to provide essential materials for people who are blind or have low vision. Their impact continues to make a difference in the lives of clients. To learn more about volunteer opportunities at CSC, click here.